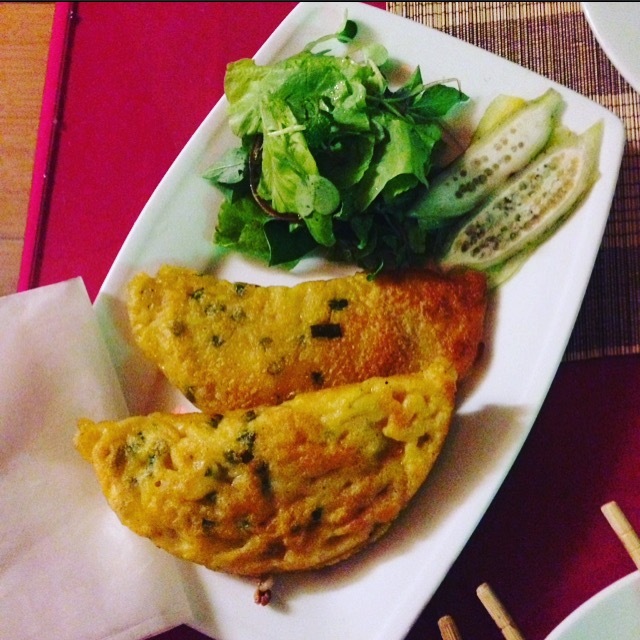 The Vietnamese Food is a little different to the Thai food, but similar to the food in Cambodia. They have a great variety of delicious food as well. 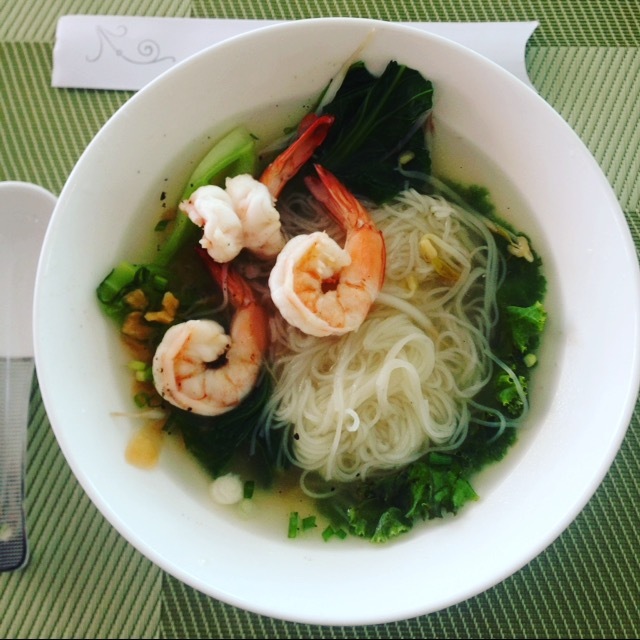 Probably the most known Vietnamese dish is the Pho Soup. Locals eat soup in the morning as well. It is very delicious and we always felt good after eating this soup. They serve the Pho Soup with your choise of meat and noodles. I prefer beef Pho. In some places you can pick your favourite noodles as well. I love the beef salad, which is served with water spinach, carrots and onions. But I always order without the onions. Unfortunate I forgot to take a photo of this delicious appetizer. 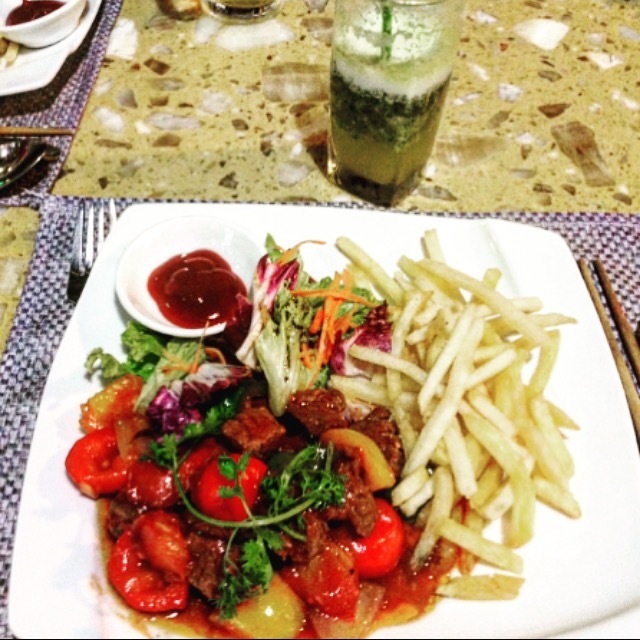 My absolute favorite dish of the Vietnamese Cuisine is the beef Lok Lak, which is often served with French fries. I guess most of the time for tourists, not for the locals 😉 The beef comes with a very delicious gravy and if the restaurant makes a good beek Lok Lak, the beef is very soft and sooo yummy!!! I hope I will find the Lok Lak seasonings here, so that I can cook this delicious meal at home too. A very good snack is a sandwich called Banh Mi. Because Vietnam was a French colony once, they have really good bread! The Banh Mi is filled with salat, carrots, meat, mint and good sauces. 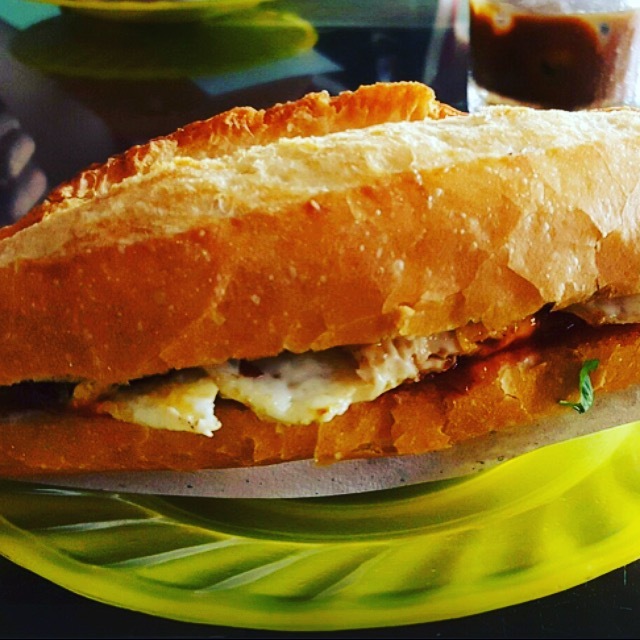 When you are going to Hoi An, visit my friend Phi, who makes the best Banh Mi in Vietnam! It tasts so good! Banh Mi made by Phi in Hoi An! Phi from Hoi An showed us and a nice couple from London a hidden restaurant with great food. It was a fantastic experience to eat with the locals: Phi ordered his favourite things and we shared everything. 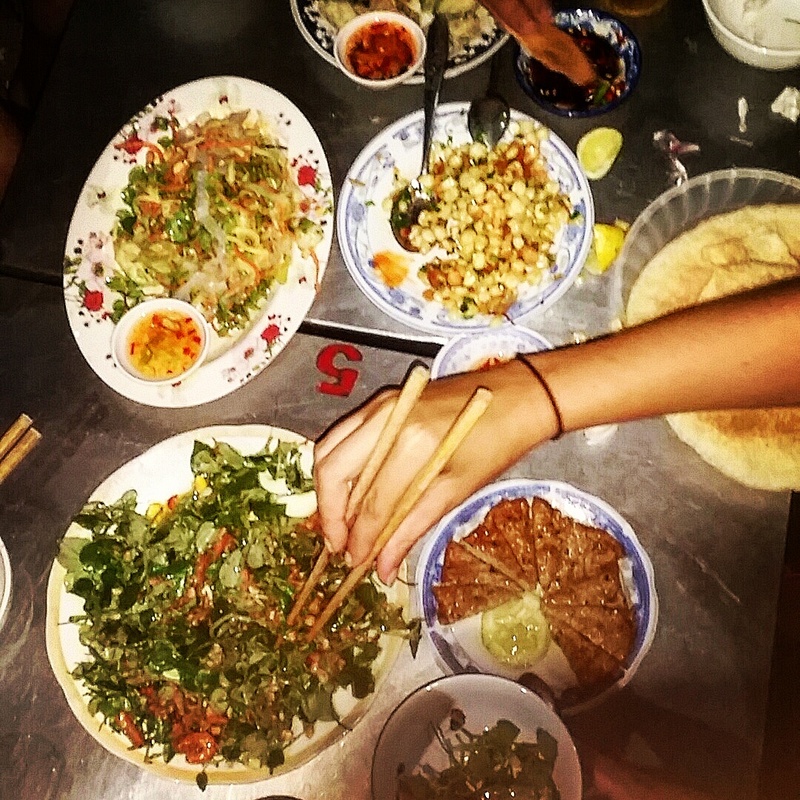 We tried Jelly Fish Salad, snailes, water spinach salad, crispy rice wraps, fish cakes and much more. It was such a delicious meal and one of my favourite nights on our whole trip. There is one special dish, which you can only eat in Hoi An. 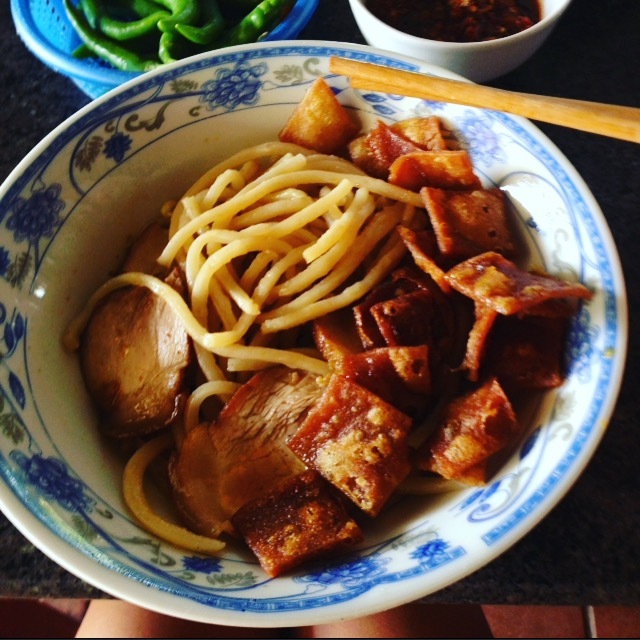 It is called Cao Lao and it is noodles with pork and some crisps on top. It is very tasty and so cheap. We went to a small restaurant, where we saw only locals and the Cao Lao was 20.000 Dong, which is about 0,85 Euro. Another southern style dish is Banh Xeo. That is a fried pancake made of rice flour filled with shrimps, onions and bean sprouts. Try the green orange Juice, this is unbelievable delicious. The green oranges are calles Cam Sanh or King Oranges and grow in Vietnam. 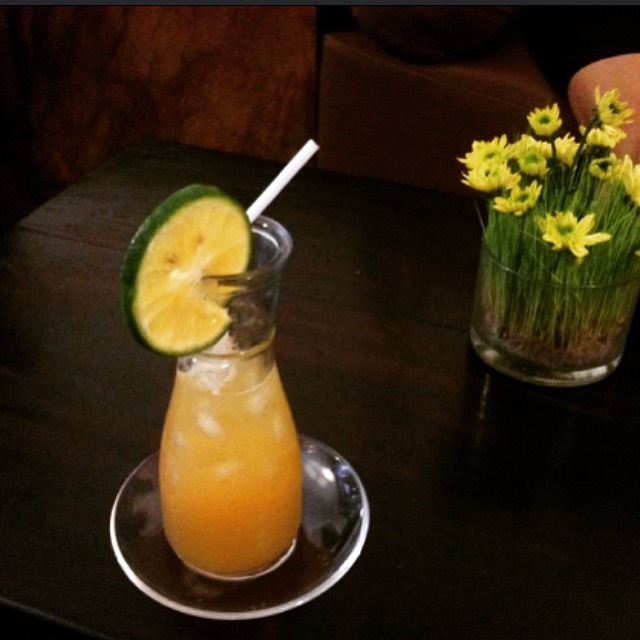 We got the Juice in the amazing Hoa Sung Spa in Ho Chi Minh City and haven’t heard about these delicious oranged before. This juice is sweet and refreshing. Don’t miss out on that. You can find fruit stands, where you can get that as well. 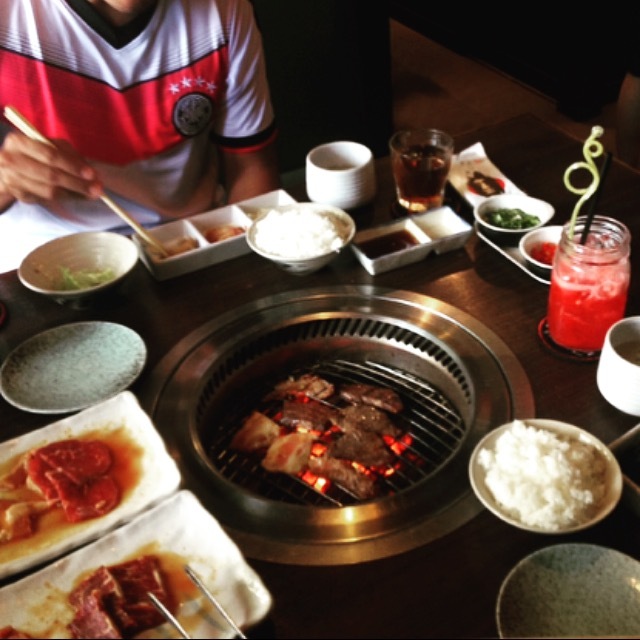 They have good lunch specials and it is fun to grill your favourite meat on your own little BBQ on your table.